I saw him yesterday in my backyard. The first rabbit of the season. He smiled at me with a giant, buck-tooth grin as he leaped through the wooded area behind my house onto my grass. Every spring and summer he decimates the grass, greedily dining on tender shoots and leaving humongous bald patches that he visits each night to deposit a pile of his round bunny turds. Oh, geesh. Really? No Elmer Fudd? I swear every kid who grew up in the 70s watched Bugs Bunny on TV. Yet, my kids have no clue what I’m talking about. 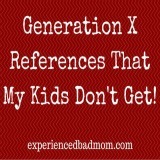 It’s just one more of my beloved Generation X references that my kids don’t get. 1. I pity the fool! I say this when one of my kids forgets to change the toilet paper role or puts the Kool-Aid jug back in the fridge completely empty. 2. What’s happenin’ Hot Stuff? This one’s fun to say when I’m just checking in with my kids. Too bad they have no clue it was originated by Long Duk Dong in Sixteen Candles. I like to say this about things such as the dismal winter weather here in the Midwest. “What’s grits?” my son asked. Every time I visit Wendy’s with my kids I say this. And every time my kids pretend they don’t know who I am. 5. Move over bacon. Now there’s something meatier. When I need someone to scoot over on the couch, this is my go-to phrase. 6. Ancient Chinese secret, huh? I loved this commercial! I’ll spout out, “Ancient Chinese secret, huh?” any time one of my kids refuses to tell me something. 7. Ooh, la la, Sassoon. When my daughter dresses fashionably? Ooh, la, la, Sassoon! 8. What you talkin’ about Willis? 9. Nothing comes between me and my Calvins. “What about daddy?” my nine-year-old asked. 10. You’ll get nothing and like it. As soon as my kids ask for more than the fair share at any concession stand, I whip out this little ditty from Judge Smails in Caddyshack. What about you? 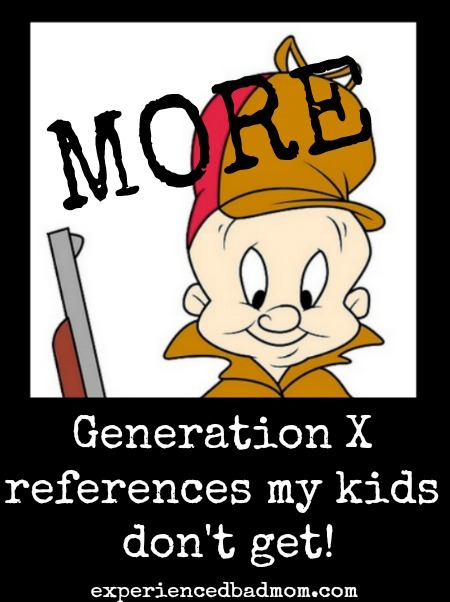 What Generation X references don’t your kids understand? “Beuller. Beuller. “Beuller.” Great list. My kids do know “Whatchoo talkin’ about Willis” only because I use that phase on them and they asked what it means. So we watched a few episodes 🙂 something we have in commom… I lived in Mayland and Canada too! Australia sounds like fun! Oh, my word, YES to Bueller. Bueller! Thanks for stopping by! It’s funny to think who are kids might be quoting in 20-30 years time! Mine will probably be quoting those inane Nickelodeon shows they like. I pulled the Sassoon thing on my daughter the other day and she looked at me like I was an alien species! I guess we are all aliens from Planet Pac Man then! Even my husband remembered that one. There’s a lot of Mr. T going on at my house. My husband is obsessed with the A-Team, though, so they’ve seen him in a few places. LOL! I’m curious about the obsession – does that manifest itself in watching The A-Team on cable? Or has it progressed to him owning the DVDs and binge watching whenever it strikes his fancy?! Some of those are familiar to me lol. OH MY GOSH YES!!! I laughed so hard and nodded all the way through each and every one of these references! Oh, girl- you brought me BACK. 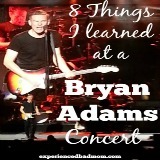 This was so much fun to read and listen to… gotta share!! That’s a really interesting list. Duck season! Rabbit season! *pause* Elmer season? I recognise most of those references but not from their original sources. Ancient Chinese secret I know from Wayne’s World! I’m starting to have the same experience you’re having with your kids but at work where some of the younger staff give me the blank stares with cultural references or even celebrities. Thanks for sharing and showing me the origins of ‘where’s the beef?’! Oh, man, I’m getting this already with my toddler – we got her one of those toy rotary dial phones and she just had no idea what it was supposed to be! Then she got mad when my mum tried to explain it was like her mobile phone, because her mobile isn’t a smartphone and the picture wouldn’t swipe across the screen. So funny about the rotary phone! My 12yo wouldn’t know what to do with one if he saw it, either. Ouch. Gotta say the only ones that really rings bells for me is the “Where’s The Beef?” and Brooke in her Calvins. Of course I am Ever so much younger than you so that must be why. Ha! And just think – when your kids talk of Brooke in a future post of their’s they’ll include the Lazy Boy Furniture clips! I like that Lazyboy commercial where she throws water in the dude’s face. Do you get that one in Canada? As an aside, my boys were in Toronto this weekend for hockey and one of the teammates got his iPhone stolen. My husband told me that one of the parents said incredulously, “But this is CANADA.” Ha! Yes to this list! My kids don’t get a lot of my references. Although they do get my Monty Python lines now. On fleek. I HATE that term. So much. Hahah Katy this is hilarious! I love ALL OF THEM, but especially “Whatchu talking about Willis?” This really made me laugh, thank you so much for sharing with #StayClassy! DYING over here! I say so many of these! 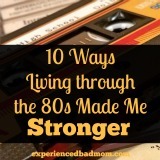 However, my youngest is 10 so my other 3 kids are pretty schooled on the 80s and 90s. We fire Princess Bride and Spaceballs quotes back at each other constantly. 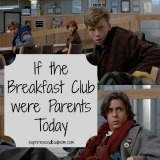 I’ve also made my kids watch several “my generation” movies. I’m proud to say I’ve raised some Goonies of my own! when my daughter was 4-5 she would always say so one time, And we would always respond with at band camp. To this day (she’s 16) she gets so mad at us when we do it, although lately I have noticed her do it to a few friends 🙂 We have several others, but of course none I can think of now.